The definitive work on business strategy for sustainability by the most authoritative voice in the conversation. 'Sustainability' seems to be one of the most popular buzzwords nowadays and businesses are being judged more and more based upon the extent to which they operate in an environmentally sound manner. However many people still remain sceptical of sustainability-based business initiatives and view them as being implemented solely to create a positive public image. 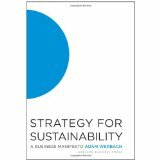 In Sustainability: A Business Manifesto, environmental activist and journalist Adam Werbach argues that adopting a sustainability strategy can save a business money. He attempts to avoid coming across as preachy, choosing instead to focus upon the financial gains that are associated with energy and resource efficiency in order to appeal to companies' desire to save money. Werbach covers a range of issues in his book, from ways in which business electricity costs could be reduced to the need to conduct business in a transparent manner. He stresses the link between profitability and sustainability, which is something that he has explored in previous magazine articles dealing with the issue of company energy use. The idea behind Sustainability: A Business Manifesto is simple; in the world of business, the only thing that talks is money so it is important for company bosses to be aware of the economic benefits of sustainability. He puts this message across in a clear, concise manner that is both accessible to the general public and speaks directly to the business world. Werbach's strength lies in the simplicity of the language that he uses. He avoids using overly elaborate wording, choosing instead to focus upon conveying information as clearly and concisely as possible. Sustainability: A Business Manifesto has received a positive reception, with the Stanford Social Innovation Review describing it as being 'profound but because it's simple, not because it's densely packed with abstruse theories'. Werbach explains the obvious but does so in a way that strikes a chord with the reader. He draws upon his own experiences as an environmental consultant to add a personal touch to his writing and demonstrate that the theories that he has included can be applied in real life business situations. The downside is that despite his best efforts to avoid preaching, he still comes across as somebody who is more concerned with educating people about the need to conserve the environment than he is about increasing the profitability of businesses. This means that the author seems insincere at times and gives the impression that he would claim anything that was ecologically friendly was also capable of increasing profits. Another criticism of Werbach's book is that although it contains some good ideas, it does not provide a clear strategy of how they could be put into practice. Cost-benefit analyses are also not included, which is a major downfall in a book that claims that sustainability-based measures can save businesses money. It leaves the reader wondering whether Werbach is exaggerating the extent to which profits can be increased by implementing environmentally-centred initiatives, as there is a distinct lack of facts and figures, meaning that there is little to support the claims he makes. In conclusion, this book is well-written and easy to digest but comes across more as an attempt to subtly promote sustainability than a serious business guide. It is full of entertaining anecdotes that illustrate the main points that the author is trying to make and is written in an accessible, appealing style. However it does not explore the practical issues surrounding sustainable business practices to an extent that would be necessary to make it useful to those who are seriously considering whether or not to implement environmental initiatives in their companies. Werbach does create a series of interesting talking points though and these points could spark discussions that lead to businesses looking further into sustainability issues. His book is easy to read and engaging, which means that it is enjoyable even though it does not suggest realistic methods for implementing the steps to be greener in the workplace that Werbach puts forward. Think of Sustainability: A Business Manifesto as an introduction to sustainability as opposed to a more detailed analysis of how it can be used in order to maximise business profitability and you will not be disappointed.